A few times a year, our iPhones let us know that there's a new version of the iOS available for download by popping up a window on the screen. But every so often, you'll see a similar message notifying you that there's a new carrier settings update. If you've ever wondered what that means, wonder no more: this article teaches you all about what carrier settings updates are and how to work with them. What Are iPhone Carrier Settings? In order to connect to a cellular phone network, the iPhone needs to have settings on it that allow it to communicate with, and operate on, the network. The settings control how the phone makes calls, how it sends text messages, how it gets 4G data, and accesses voicemail. Each phone company has its own carrier settings. Unlike other settings on your iPhone, which you can view and configure, carrier settings are hidden from the user and can't be manually changed. How Are They Different From an OS Update? An OS update is a much bigger, more comprehensive update than a carrier settings update. The biggest versions of OS updates—like iOS 10 and iOS 11—introduce hundreds of new features and major changes to the interface of the iOS. The smaller updates (like 11.0.1) fix bugs and add minor features. Updates to the OS affect the foundation of the entire phone. Carrier settings updates, on the other hand, are just small tweaks to a small group of settings and can't change anything other than how the phone works with a given cellular network. 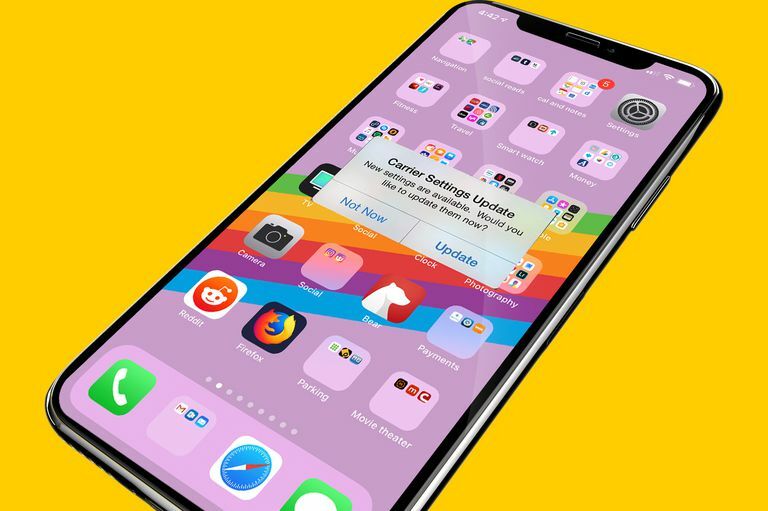 How Do You Update Your iPhone Carrier Settings? Updating your carrier settings is simple: when the notification pops up on your screen, tap Update. The settings will be downloaded and applied almost instantaneously. Unlike with an OS update, there's no need to restart your iPhone. You can usually postpone installing most carrier settings updates by simply tapping Not Now in the pop-up window. However, in some cases (usually due to security or major network upgrades), carrier settings updates are mandatory. In those cases, the update is automatically downloaded and installed. A push notification with just an OK button lets you know when that's happened. Can You Check For New Carrier Settings? If there's an update, the notification should appear here. You can also prompt a carrier settings update by inserting a new SIM card into a phone that's connected to a different network than the previous SIM used. When you do that, you'll be given the option to download the settings related to the new phone network connected to the new SIM. Can You Manually Update Your Carrier Settings? Yes. In most cases, the automated notification will do everything you need. If you're using an iPhone on a network that's not one of Apple's official, supported partners, you may need to configure your settings manually. To do that, read Apple's article ​about cellular data network settings on your iPhone and iPad. Can You Find Out What's In A Carrier Settings Update? This is harder than you'd expect. With iOS updates, Apple generally explains—at least at a high level—what's in each iOS update. With carrier settings, though, you won't find a screen that gives the same explanation. Your best bet is to Google to find information about the update, but chances are, you won't find much. Luckily, carrier settings updates don't carry the same risk as iOS updates. While an iOS update can (rarely) cause problems with your phone, it's virtually unheard of that a carrier settings update can cause any problems. When you get the notification of an update, your best bet is to install it. It's quick, easy, and generally harmless.